COAT by Harbison, Spring 2015, United States. All photographs © The Museum at FIT, New York. It has always been a struggle for the African American, whether the battlefield has been civil rights, politics, entertainment, culture, or art. Underlying all of these, and much more, has been a wrestling with identity, of coming up with a sense of self that was true, historically rooted, and as an avenue for self expression within the predominant Caucasian culture. While fashion might seem an unlikely realm in which to resolve the contradictions and tensions inherent to black identity, in many ways it is a timeline, deep with symbolism and broad in inspiration, with which that journey can be measured. Thus it was amply shown with “Black Fashion Designers,” recently closed at the Museum at the Fashion Institute of Technology (December 6, 2016 – May 16, 2017). What makes black fashion? It is perhaps best likened to a quilt or tapestry; filled with individual parts that up close seem unrelated or separate, but from afar come together to create something wild, diverse, unusual, meditative, and beautiful. Each African-American designer, whether recognized for her or his talents or sitting in the shadows, out of the limelight, had to swim against the inertia of prevailing institutions that were built by a largely white demographic. The central triumph of FIT’s exhibition was in raising awareness of these makers and trendsetters, and by selecting representative pieces demonstrating how wide-ranging the contributions of black fashion designers truly has been. In isolation, it can be difficult to envision the breadth of the field. WEDDING DRESS (front, back and detail) by Ann Lowe, made for Judith Tabler, 1968. The exhibition exploded that limited vision with seventy-five ensembles from sixty different designers. In the darkened corridor of the Fashion & Textile History Gallery, rows of illuminated mannikins told a nuanced tale of African-American expression, from past to present, starting with Anne Lowe’s wedding dresses. Five divisions made up the exhibition and provided it with structure; Eveningwear, Menswear, Street Influence, African Influence, Breaking Into The Industry, Experimentation, Black Models, and Rise of the Black Fashion Designer. One striking example from 1968 featured a sweeping train and a figure-hugging bodice, plain and nearly unembellished but for a garland of appliquéd flowers trailing near the hem. These blooms scatter themselves across the train, as if the bridesmaids were tossing flowers in the bride’s wake. A collar of flowers along the neckline complete the natural simplicity of Lowe’s dress. What this elegant article neglects to publicize is Lowe’s prominence as the fashion designer for the rich and famous. She learned her craft from her grandmother, Georgia Cole, a former slave from Alabama. Cole’s own story is one of those old school romances, having been liberated by her husband, a free black man by the name of General Cole. That her granddaughter would one day be couturier to Jacqueline Kennedy (whose wedding dress is also in the exhibition) is proof that African Americans have and continue to flourish in spite of adversity. DRESS by Balmain (Olivier Rousteing) of raffia, silk, rhinestones, Spring 2013, France. JUMPSUIT by James Daugherty of polyester matte jersey, circa 1974, United States. DRESS by Jon Haggins of silk, 1980-1985, United States. LEGGINGS AND HAT by Patrick Kelly of spandex, straw, cotton, Spring 1988, France. However, the beauty of the exhibit was putting into context the sheer range of aesthetic contributions made by black fashion designers, from the simple and the demure to the loud, fun and exuberant. A checkered dress from Balmain, the French fashion house which recently designed costumes for the Paris opera, is a nearly Wonderlandian ensemble combining the glitz of Mardi Gras with a surreal twist on medieval pageantry. Olivier Rousteing, the man behind this chic, starchly embroidered outfit, became the creative director of Balmain when he was just twenty-five. Despite being seen as a black sheep in the fashion world, for reasons beyond just his race, Rousteing made significant changes in the Balmain brand, increasing its percentage of sales for menswear to forty percent, and opening up a boutique in London. He also has helped evolve its aesthetic, hybridizing Western designs with Asian influences. Perhaps of most notoriety in this digital age, Rousteing tipped Balmain over the one million follower mark on Instagram, thanks to his dedication to taking selfies with a variety of celebrities, among them Jennifer Lopez, Beyoncé, Chris Brown, and Rihanna. The understated elegance of James Daugherty and Jon Haggins was a look at the other end of the spectrum, and their simplicity on first glance may conceal their fundamental contributions to fashion. Daugherty’s sleek polyester beauty, in glowing sea foam green, is a form of jumpsuit evocatively dubbed a “sizzler” by Ebony magazine. Born during the 1970s, his slinky design was emblematic of the era. Daugherty himself got his career underway working for the celebrated American costume designer Edith Head, and would end up teaching at the FIT. Haggins’s royal blue silk number features a plunging back-cowl and a geometric staircase surface pattern that shimmies its way down around the waist and hips. A graduate of FIT, he founded his own fashion label in 1966. His decision to move away from stiff, structural dresses towards loose and elegant fabrics that draped languidly upon the body laid the groundwork for the decade to come. ENSEMBLE by Christie Brown of cotton, synthetic, Spring 2016, Ghana. The section named African Influence spoke to the challenge of deriving inspiration from Mother Africa without falling into imitation. Some pieces, such as a pair of trousers and a clever hat made to mimic the practice of African women balancing a basket on their heads to carry food and goods, by famed black designer Patrick Kelly, were playful homages. Others, like a diaphanous dress adorned with flowers, cut out patterns and paisley edging by the fashion brand Christie Brown, are actually from Africa. Christie Brown originates in Ghana, and was established by Aisha Ayensu in March 2008. Named eponymously after Ayensu’s grandmother, the relatively young brand won Emerging Designer of the Year Award in 2009 at Arise Africa Fashion Week in Johannesburg, South Africa, and also earned the right to represent Ghana in the Parisian Arise L’Afrique-a-Porter in 2010. Both bright and floral, with a screen-printed scene of the savannah decorating the back of the coat that rests on the wearer’s shoulders like a mantle, the piece is most unique for the open-work appliqué panel covering the chest, which mimics the paisley patterns adorning the waist. JACKET (back detail) by Pyer Moss, Spring 2016, United States. 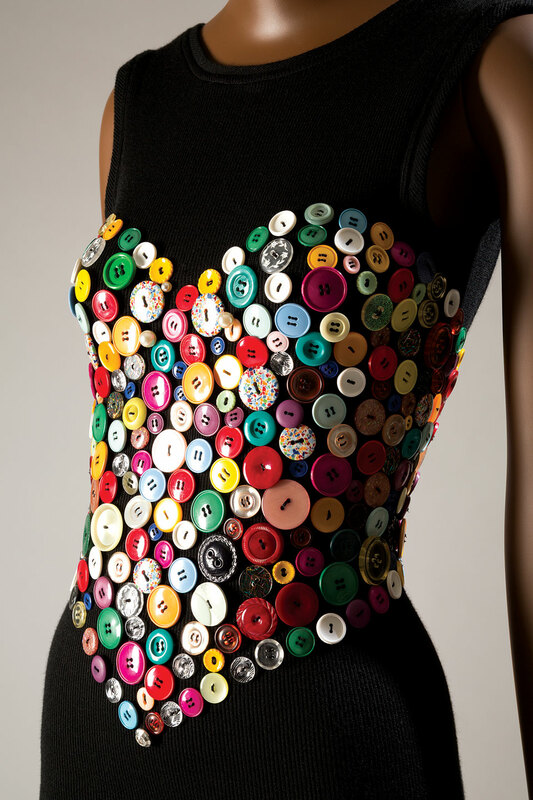 The exhibition was unafraid of tackling the unpleasant social issues that are part and parcel of the lives of these designers, and the political angle of black fashion was explored in both t-shirts, which featured loud, demonstrative statements on injustice and the environment, and fully realized garments. Such was aptly, and soundly, displayed by the duality of a t-shirt and a men’s jacket by Pyer Moss, an American fashion label founded by Kerby Jean-Ramond, a Haitian-American whose parents came to the States in 1980. 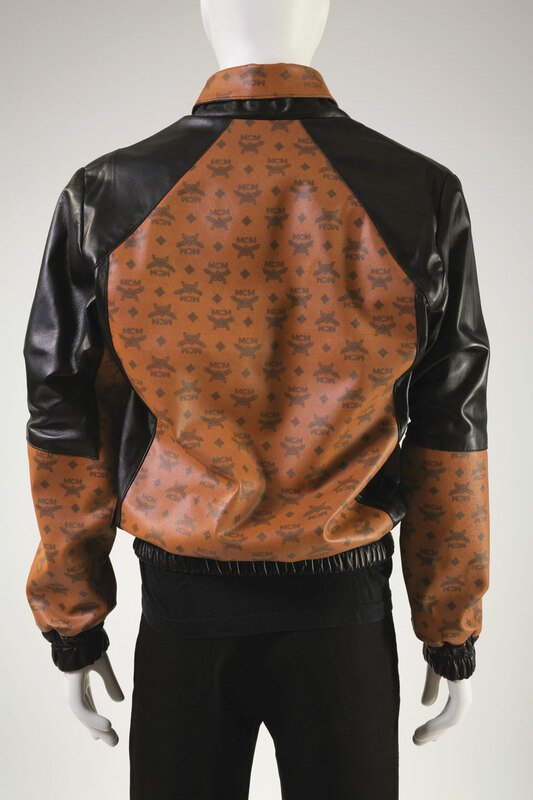 Along the hem of the jacket in raw paint reminiscent of graffiti is scrawled the words “We Already Have a Black Designer.” The white shirt is a reliquary of names of those black men who have died in confrontations with the police, and was worn by Jean-Ramond to his spring 2016 fashion show. Throughout the exhibit, the unveiling of this history is a potent reminder of the vitality and contribution of these artisans to the contemporary fashion movement. Patrick R. Benesh-Liu is Associate Editor of Ornament and continues to find time to enjoy craft in between writing, travel and tech support. This year saw him visiting New York for the veritable deluge of fashion shows on display during this past spring, such as “Black Fashion Designers” in the Museum at the Fashion Institute of Technology. After observing the parade of garments and ensembles made over several decades, he comments, “You learn that some of the seminal styles of the twentieth century were pioneered by African-Americans. The slinky, silky jumpsuit that filled the discotheques of the 1970s? That is called the sizzler, and it was made by James Daugherty.” Back on the West Coast, it was his pleasure to meet Bhagwan Das Soni and cover the trunk show of his jewelry at the Fowler Museum at UCLA. 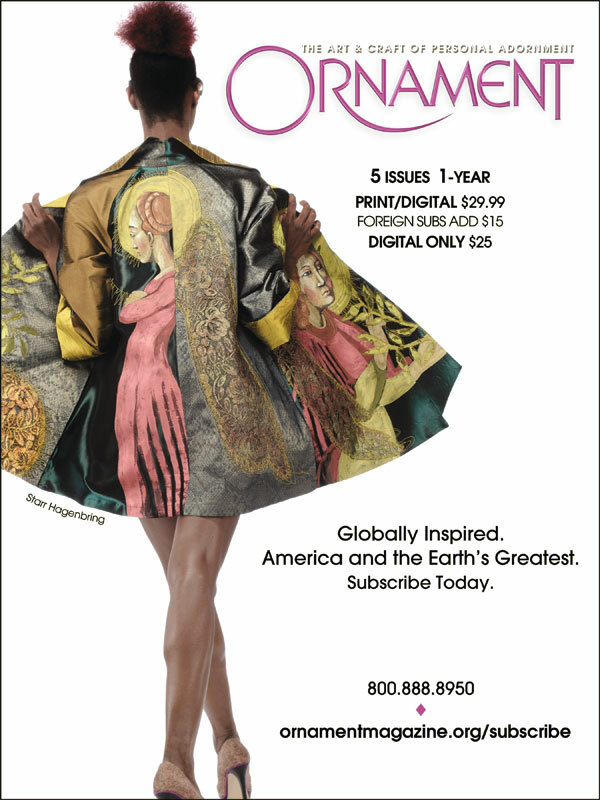 As Ornament’s reporter, he also provides a zesty compilation of the latest news in craft. JUDITH LEIBER MINAUDIERE from Fall 2013, illustrating Snow White. Photograph © Judith Leiber. Glass slippers. Red riding hoods. Golden locks. Fashion has always played a central role in fairy tales, symbolizing transformation, vanity or power. And throughout history, these stories have inspired artists and designers to create capes, shoes and ballgowns worthy of the fairest of them all. The Museum at the Fashion Institute of Technology’s recent exhibition “Fairy Tale Fashion” displayed more than eighty enchanting objects in a magically decorated gallery dominated by a central castle. Curator Colleen Hill—a sunny blonde who could pass for a Disney princess—conceived the show as a through-the-looking-glass view of fashion and storytelling. “I’d had this in mind for a little while, but I was thinking more abstractly about how fashion journalists often describe especially lavish and beautiful clothes as fairy tale fashion,” she explains. However, she did not know where to start; in The Museum at FIT’s collection, she says, “everything’s high-end, everything’s intricate.” It was not until Dolce & Gabbana and Alice + Olivia presented their fairy-tale-themed Fall 2014 collections that Hill’s ideas crystallized into an exhibition examining high fashion through the lens of fairy tales. Kimberly Chrisman-Campbell is an art historian specializing in fashion and textiles, and a frequent contributor to Ornament. She has worked as a curator, consultant and educator for museums and universities around the world. This issue, she goes behind the scenes of two very different exhibitions, The Museum at FIT’s “Fairy Tale Fashion” and the traveling enamel art show “Little Dreams in Glass and Metal: Enameling in America, 1920 to the Present.” Chrisman-Campbell is the author of Fashion Victims: Dress at the Court of Louis XVI and Marie-Antoinette, published by Yale University Press.